Not much has changed, there are still many beautiful places to visit and explore. On this trip, however, I was struck by the depressed nature of homes and towns along many of the beautiful shorelines that we passed. The area had always been poor and dependent on the fishing industry, but on this trip it looked like every other house was up for sale. The traditional fishing industry is in shambles with the overfishing and consequent depletion of cod and haddock – the staples of the past. We went out with a 5th generation lobsterman on Grand Manan Island off the southern tip of New Brunswick. Close to shore lobstering on small traditional boats is no longer as profitable in this area as it once was. 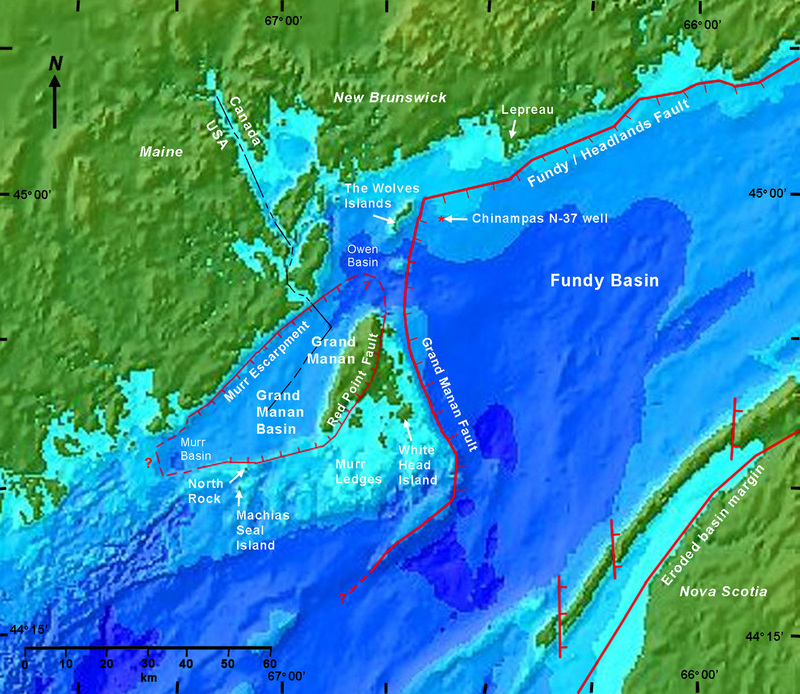 Many of the shallow lobster areas have been mined out. 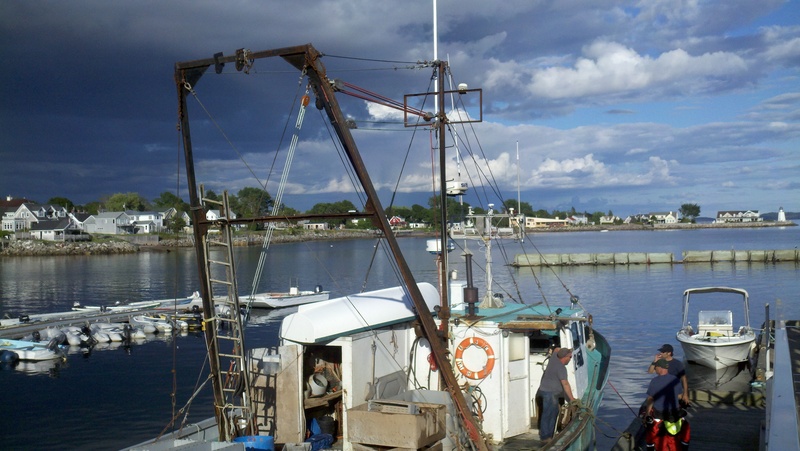 Million dollar boats requiring a large crew are now needed to catch lobster in much deeper parts of the Bay of Fundy. It is a tough life and who knows how long these deeper lobsters populations will last? 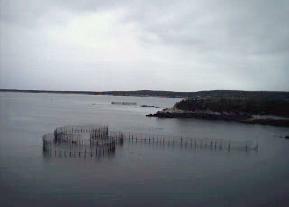 On our trip around the island, we passed pound nets with heart-shaped weirs for catching schools of herring. We also circled leased areas where floating, salmon fish farms had been created. These 100 foot diameter circles were netted compounds that held 25,000 salmon each. The fish take 18 to 24 months to mature. There were often 10 of these large nets in any one lease area. The waste and the antibiotics associated with these types of operations are probably disseminated more effectively here relative to many fish farms elsewhere as a result of the strong 30 foot tides in the Bay of Fundy. 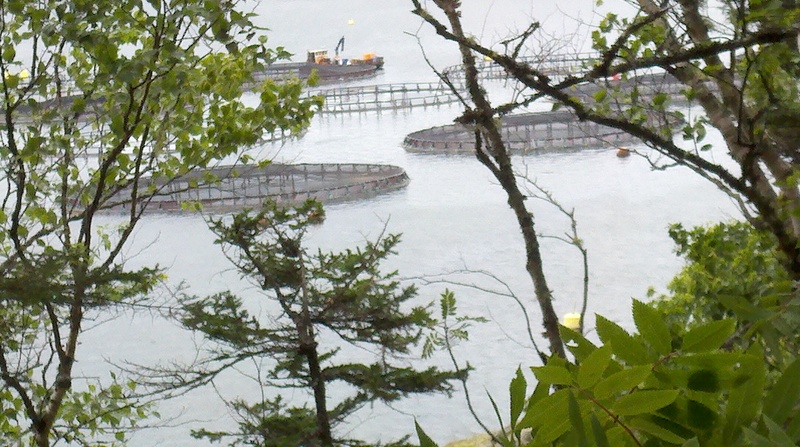 In stark contrast to traditional fishing in this area, fish farming in the Maritimes is dominated by large conglomerates. It is disappointing that we cannot manage our once vast, naturally occurring, marine resources where they can be sustainable. It is becoming increasingly accepted that we will raise most of our fish in these netted cages in the future. One concern with these fish farms is that they are often placed close to shore where the residue of our society is often flushed. We will have to monitor the health of these cages and the surrounding waters to prevent diseases from attacking both the farmed fish and what is left of the native fish. As the demand grows, so will the attention and the regulations on these industries. For more information on the future of fish in our oceans read the Oceans Chapter of Saving the Places we Love. Take-a-way: We citizens need to be extra vigilant in where we dump our waste streams. Our oceans are changing in acidity, toxicity, and temperature as a result of the continued burning of fossil fuels, and the continued dumping of wastes into our rivers. We are threatening the entire food chain on which we are so dependent. By nedtillman2 in Calls to action, Oceans on September 14, 2015 .